The rehabilitation of MIN-320a consisted of bank restoration, installment of a livestock watering pad and cedar rail fencing to restrict livestock access to the river and vegetative plantings. Sites MIN-320a had extensive erosion and lack of canopy due to improper land use practices and unrestricted livestock access. Fluctuating water levels also undermined the stability of the banks creating large amounts of erosion and sediment discharge. In order to rehabilitate this site, bio-engineered site designs were created to prevent further erosion and sediment discharge. Large excavators were used to grade the vertical eroding banks back to a 2:1 slope. The resulting banks were vegetated with native grasses and tree/shrub species. A designated livestock watering pad with angled cobble and fencing prevent further erosion. Manitoulin Streams restored this severely degraded aquatic & shoreline habitat, which in turn will prevent erosion of soil from its banks reducing sedimentation from occurring over critical spawning habitat and providing sustainable fish habitat and structure to increase productivity of salmonid and other associated cold water species. Improving the fish habitat (channel edges, channel centre, reducing the width/depth ratio by narrowing and deepening the channel, creating pools, improving available river bottom substrate, and riparian vegetation/canopy) in this area will reduce the effects of low water levels and increased temperatures in the summer and will enhance the overall quality and productivity of this river’s aquatic and riparian habitats for the long term. 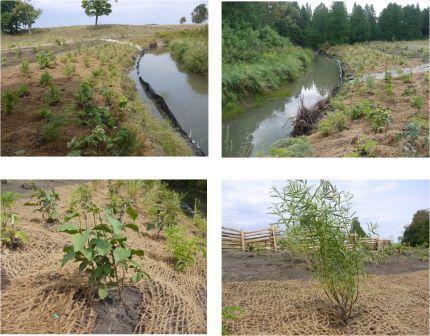 Proven bio-engineering techniques were used for riparian zone restoration that will provide fish and wildlife habitat along the river edges. The riparian area was restored by planting native tree and shrub species such as eastern speckled alder, red osier dogwood, chokecherry, flowering raspberry, sandbar willow, shining willow, slender willow, elderberry, meadowsweet, nannyberry and native grass seed. This will shade the creek so the water will stay cooler, which will help to maintain an ideal overall water temperature for all cold water biota as well as to provide future suitable shelter and shade for a variety of aquatic and wildlife species. Tree plantings were also planted on the top of the east bank that was lacking any riparian or canopy zones. Soil stabilization consists of using coconut coir fabric and planting of native grass seed. This project had 7 volunteers from the Board of Directors of Manitoulin Streams participate in planning and actively volunteering at rehabilitation sites. The total number of hours volunteered for this site is 51.4 hours. A total of 3 volunteers contributed 33 hrs of time transporting cedar rail fencing to the site (trailers, trucks, gas), tree planting, use of chainsaw to create up right posts and labour. Ontario Rangers had 2 leaders and 7 rangers help out with building a 52m cedar rail a total of 36hrs of labour. The landowner was only able to contribute 4 hours attending meetings due to a unforeseen medical issue that arose. Funding contributions toward the construction of the project include Community Fisheries & Wildlife Involvement Program (CFWIP), Canada-Ontario-Agreement (COA), Ausauble Bay Conservation Authority and Northern Ontario Heritage Fund Corporation (NOHFC), Environment Canada, National Turkey Federation and TD Friends of the Environment. *This project was completed in two sections as it was located within two different properties, click here for direct link to MIN320b!